As you might guess, I’m a big fan of web search. Disclosure: I work at Google now, but I’ve always felt that being able to effectively search is really a key skill, whether you’re searching in a library or in an online web-based corpus. And we know that being able to provide your users with easy-to-find information is absolutely essential. A while back, Google introduced something called “Custom Search Engines” (CSE) – it’s basically a way to make a very simple widget that lets users search a particular piece of the web. Since you get to say which piece of the web gets searched, you can focus in on information that’s very targeted to your users. What that really means is that when you do a search using the widget at the bottom of each CPU posting, that search is limited to just the contents of all the CPU postings and the comments. To use it, just type your search terms in the box on the left (where you see the words “Google Custom Search” in light gray). Hit enter, and, voila.. you’ll find the posts you seek. If you have a website or run your own blog, you might want to consider adding your own Custom Search Engine to it. It’s really pretty simple - it took me about 3 minutes to make our CPU Custom Search Engine, then another 5 minutes to fit it into the Typepad HTML. As I mentioned, I dropped the search box onto the bottom of our CPU blog posting page. I know, I know… that’s a terrible place to put it if you’re looking for traffic. But I was really curious how many people read all the way to the bottom of the post and would then use the feature. 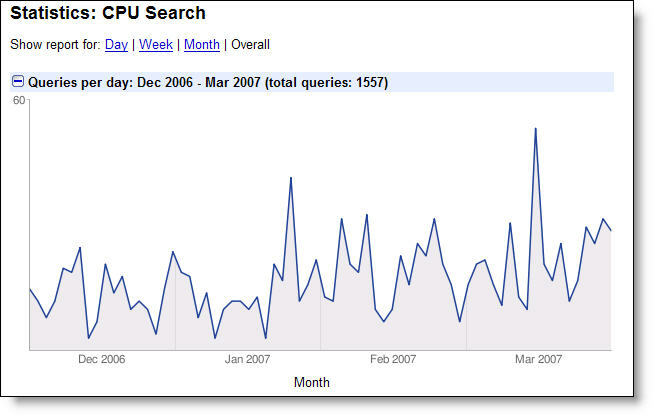 Figure 2: Statistics of the CPU Custom Search Engine. Uses per day since startup. As you can see, we’re slowly picking up more and more traffic over time. This is a typical adoption curve for a well-hidden feature. It’s been used a little bit each day. Notice how use typically drops on the weekends. Is that because we tend to post midweek, or are all you readers checking out CPU at work?? Now that we have some experience with it, it might be time to move it up to the top of the page. Consider adding custom search as a way to quickly and easily increase the overall usability of your web site / blog / whatever… Since it’s now pretty easy, you no longer have any excuse for making your users work to find the information they really want about your product. Just out of curiosity, now that the secret is out, how many of you noticed the search box down there, and never tried it out? If not, can you say why? And if you have tried it out, did it work for you? Inquiring minds want to know! We're experimenting just a bit to see if we can't make CPU an ever-better place to learn the latest and greatest. Tell us what you think! What about not finding stuff because you can't find the search feature? It's not bad that the search dialogue is "hidden" at the bottom of the page, but it _is_ bad that it is hidden in the real sense from the browser's search function which (in Safari and Firefox at least) only finds words in website text but not in buttons. Since the "Search" box is often at different positions in web sites*, I usually just do a quick search for the word "search" with the browser's search feature. Maybe other users are doing this as well? My technique didn't find CPU's search box however, since it does not contain the word "search" outside of a button. Any thoughts on this? I'm a big fan of CSE myself. As a librarian, I strongly support better searching. the best way is either to ask someone else for tips (like a librarian :-) ) or to read the help. Help / tips / suggestions in databases & search engines are gold mines of information, but sadly underused. there is no search box. I would never have thought of going to your start page (http://headrush.typepad.com/creating_passionate_users/) to search. Thanks for sharing. I love Google search, it makes my life easier. Does this in any way add to the blogsearcg facilities that already exist within my blogger blog? I use RSS, so of course I've never seen the search box. If i'd wanted to look something up, I guess I would have tried your main page if I knew CPU was where I wanted to look. Otherwise, I might have tried a main google page. The search box only appear at the start page, not at the pages for individual posts. That's why I never saw it. I just want to 'third' what Yoni and David V. said. Cheers. I was turned on by this news. Then I did it. Based on the premise/promise that I could restrict searches to the web sites I wanted and not have the searches go google-wide, I inserted the code in my blog and four web sites I run. Then I tried to run some searches. Instead of getting results such as those shown in CSE demo pages, I got results that obviously were google-wide, largely sending people who wanted to search my sites to other sites, including competitors. I even tried adding the most common competitors to the exclusion list. In the end, I continued to get competitors' sites when my key words are searched, usually before my page links show up. In some cases, the sites I specified don't show up until the third or fourth page. So I am forced to delete the code. Not a way to Convert Passionate Users. Thanks for any thoughts or advice you may have. Okay. Here's an amendment. Apparently the CSE works as advertised on my web sites but not on my blog. Incidentally, the blog is on Google's blogger platform. I'm one of the RSS-only readers. My RSS reader (Sage) renders articles for me so I don't even get most of your CSS, and I certainly don't visit the main page ever. But even if I had, I probably wouldn't have used the CSE. If I wanted a custom search I would have used site:headrush.typepad.com in my search. If I found myself searching CPU on a regular basis I would have created a firefox keyword search so I could type "cpu search terms" in my location bar to search for "search terms". I fourth what Phil, Yoni, and David V. said. I read via RSS (and in fact just posted to my own weblog about how weblogger practices affect my likelihood of visiting their weblogs), and when I visit CPU it's usually only at article pages rather than the main page. I had no idea there was a search function, because I haven't been to the main page of the site since the day I subscribed. I'm with the commenter near the top - I tend to search pages for the word "search" when I want to search the page. Interesting others do that too! Another "me too" re reading through RSS. I don't remember even having clicked through to the website before posting this comment, let alone having visited the homepage. I read through rss as well and have had the same problem others mention. On a positive note, I love this blog. Now that there is a search I will be able to send links with my references to your old posts. Ditto all the comments about arriving via RSS feeds direct to the article. I rarely visit the main page (unless I've been away and missed a few articles). So no, I'd never seen the search feature either. Since I just read CPU from the RSS feeds, I didn't notice the search. 1) It just uses Google main index. If you don't have a really popular site like CPU, almost all your pages won't show in the results page. 2) I doens't support accented letter. You your site isn't in a language devoid of accents as English, nothing will be displayed in the results. Before installing this make certain that you have a updated sitemap or the there are ample navigational links on your site to all of your content. If the Google bot does not find a page - it won't be listed on the results......and the longer it takes for Google to cache that page in their index, older your newest material will be in the returned search results. I havent completely understood the mechanism behind CSE. But its great that you added it here. I was trying for a long time to read your post on "Crash course in learning theory" but could never get to the page. I think its a broken link. With the search feature I could actually find that page and read through it. Am still trying to search for more articles. Neither I noticed it, although I do read all your posts since a while. I use google reader and come directly to the post, i.e. not homepage. Of course we read CPU at work. That's what my day job is supposed to be, "Creating Passionate Users." Besides, if you ever try to google "zombies" on a regular google it takes quite a while to get to the CPU article I really wanted. Finally, a search option for CPU, I've been wanting this for a loooooong time, all the while expecting the standard layout somewhere up in the sidebars. Do I dare quote? "1) User-friendly: Easy to use when, where, and how you need it." It works fine, add another vote for getting this up in a visible place on every page! I used the search function the other day whilst in a meeting with a co-worker to find your fantastic Moleskin article. I like the functionality but I must say I was a bit upset to the see the ads. I'm a realist and work for a commercial website so it's not a gripe, more a shame. To the RSS reader folks... Right. I'd not thought about the RSSers in the crowd. Excellent point. Don't know there's much I can do about it thought. Maybe just include a link to the main page, although that's a hassle. Any good ideas from expert RSS feed designers? About not putting the search box at the top... I KNOW the bottom is a crummy place to put it. But as I mentioned, we wanted to get a little practice with it before unleashing it on everyone. A really great practice to encourage is Testing The Product before shipping. In this case, we knew that relatively few people would find it at the bottom. That way we could watch how people were using it (or not) and test for good behavior. William -- I'm not sure why your CSE isn't working on your Blogger site. It could be that your pages aren't linked to by other sites, or that you've got a typo in your "included sites" list. Try deleting it and rebuilding from scratch. Also, check to make sure that regular Google can find your pages. That's true in general, no CSE is going to be able to find pages that the general Google search engine can't. If you're not linked to some other pages on the web, Google's spider can't find the pages (and therefore, can't index them). WRT diacriticals, while Google can improve their handling of words with diacriticals, it pretty much works right now. Try doing a search for a word like "matemáticas" and compare with "matematicas" -- or "über" versus "uber." Part of the problem might lie with the way diacritical letters are inconsistently handled in texts. But I don't think it's really a Google-specific problem.